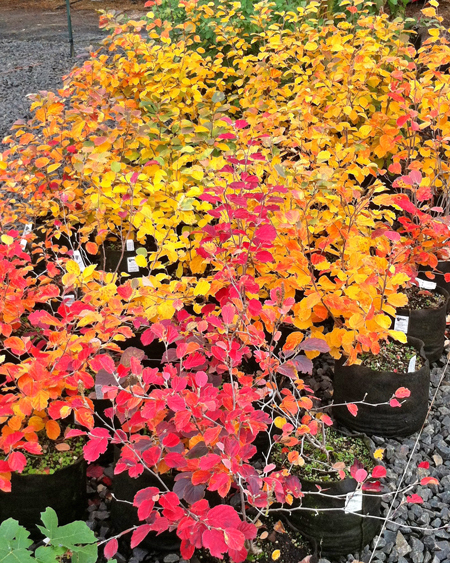 These delightful deciduous shrubs are compact, slow growers that reach 2 to 3 feet tall with a similar spread. In Spring, bottle-brush like clusters of snow-white, fragrant flowers blossom, sometimes before the leaves emerge. The leaves exude a smooth, cool frosty-blue green hue that adds a nice chilly touch to the landscape. As fall approaches, the leaves transition through a beautiful display of yellows, oranges, and reds. These plants will grow in full-sun to partial shade, although they will flower more in full sun. They prefer average, well-drained soil that is slightly acidic and rich in organic matter. Great choice for hedges and borders!